If you’re looking for a quilt pattern for beginners today I have a good news for you. I invite you to make a quilt along with me. Quilts are beautiful, it doesn’t matter if they are simple or complicate to make, once a quilt is finished will add beauty to any room. If you’re looking to make one, but you’re afraid you’re not good at quilting, why not to start making an easy to make quilt, I’m sure you’ll be doing great and at the end when you finish it, it will be fantastic! If you’re a expert quilter, and you already had made a few, a new quilt to make is always a great addition to your collection of quilts. Quilts made by Ale Balanzario. Yes, I’m Ale Balanzario, and I love to make quilts! I really enjoy the time I spend working on a quilt, and today I would love to tell you something about how I use to do my patchwork quilts. I like to work on my own patterns, and most of the times I don’t follow “some” quilting rules, my quilts can start at one point at the beginning, and while I work on my quilt, it might change, but I love how my quilts are when they are finished. If we talk about quilts, 2017 has been a good year for me, I never thought I could make as much quilting work in one year. I started this year working on my quilt “four seasons” , everything went well and I could finished, this quilt used to me an UFO, but not anymore, it’s all finished. Then I started a new big quilt, (king Size) this was the Blue and white stars quilt, I made it to give it to my son and his wife. But now, I would love to start working on a new quilt, but this time I would love to invite you to quilt along with me. No name yet for this new quilt. I don’t have a proper name for this new quilt yet, but I’m sure while I work on it, I will find a nice name for it. I want to work on this quilt with small blocks made of 4 squares (5 x 5 “, 2 in white and 2 in beige) if you want to make this quilt along with me, you can start working on the blocks, make 4 or 6 to begin with. 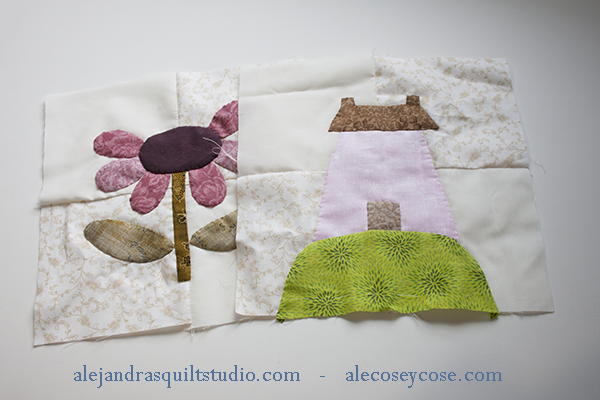 I love to work with applique, so I will be working on a few designs for this quilt. I would love to make a big quilt again, maybe a new King Size quilt, as this time I’m thinking on my second son and his girl friend, they might want to have a quilt made by me, I let you know when I finish this quilt if my son and his girl friend said “yes” to this quilt or not. Some Q&A about this quilt. How big will be this quilt. The good thing about working with blocks is, it doesn’t matter how big I make this quilt, you can make it as big as you want to. If you don’t want to make a big quilt but you want to quilt along with me, to learn how I work on my quilts, you can make one 4 blocks to make a pillow. 4 or 6 blocks will make a nice wall hanging or a small quilt to place on a table. If you’re expecting a baby or a grand kid, then you will need to make more than 6 blocks, (I will let you know later, how many blocks you will need to make). A Twin Size quilt, Full Size quilt and Queen Size quilt. While working on blocks, you will find how easy is to work to make a bigger quilt, I will give you the free patterns to work on, and you can make just one time every pattern, but if you’re planning to work on a bigger quilt, you can make two or three times every pattern. How long will this quilt take to be done. I’m planning to work one block every week, (the design or pattern) but you can make two or three times every block, if you want to go faster and make this quilt faster. Hand quilting or machine quilting. Both quilting will go fine with this quilt, work on the quilting you love to, but I will be working on hand quilting, as I’m a fan #1 of it, I love the texture and I love the time I spend working on it. Any embroidery on this quilt? Yes, I’m also a big fan of some embroidery on quilts, embroidery makes quilts more interesting and it looks great on quilts. When can you start working on this quilt? Right now, I’m happy to say the first PDF file is ready and you can click here to download the first free pattern! Can I share this pattern with my friends Ale? Sure!! I would love if you share this new free pattern with your quilting friends, the more people make this quilt it will be nice! Does this quilt patterns will have a cost ? Well, I say this is a free pattern, but I will be working on making the patterns, some videos to explain some embroidery stitches and how I will be working on the quilting. If you would like to invite me a coffee one day, that will be nice, I will add a “donate” button to some of this quilt post, and it will nice if you invite me a coffee or a tea sometimes. 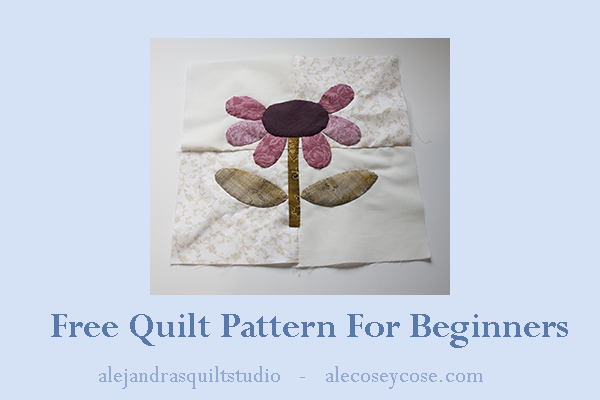 You can join my Facebook Fans Page Alejandra’s Quilt Studio to be the first to know when the second free pattern is ready for you to download.